According to Fran, Miss Polly’s personal assistant, Miss Polly is a rather sedate 16 year old who has always been pretty laid back about everything. All that changed when she discovered my YouTube videos. That’s great to hear, Miss Polly. And thanks to Fran for sending me this wonderful photo. 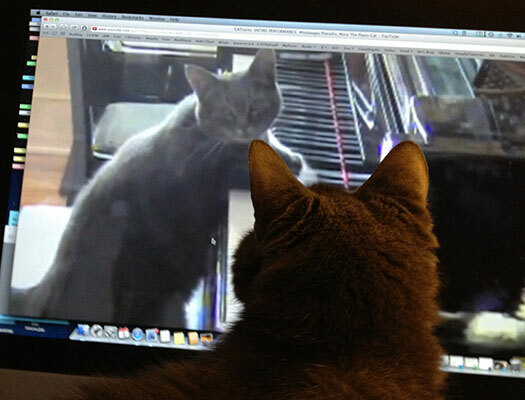 If you’d like to send me photos or videos of your feline companions watching my videos, please do so. And include your names, as well. By sending me the photos or short video clips (links to clip on YouTube preferred, if available), you are agreeing to allow me to post the images or links on my blog/website. Really cool, Miss Polly catching a glance at you on utube. Nighty night, Nora.